Just by looking at the talent from the authors involved in the creation of this story, it should be a hell of a lot better than it actually is. This story marks the final script to come in from Dalek creator, Terry Nation, one of the series' oldest and most reliable writers. But this story is also the first outing of Douglas Adams as the series' script editor, who had written The Pirate Planet, for the previous season and had now taken up one of the biggest chairs in Doctor Who production history. And at its time, Destiny of the Daleks was a massive hit, setting new viewing audience figures along with the following story, City of Death. Both were helped of course by ITV having striked and going off air for a while. But there is also a lot to enjoy in this story, especially in the opening episodes, it is such a shame that in the final episodes the story peters out. What doesn't help is the revisionist take on the Daleks and the resurrection of Davros, the Daleks' insane creator. Both of these factors makes this story a lot less interesting than the previous Dalek adventure, Genesis of the Daleks. It somehow manages to sink even lower with the introduction of the Movellans and their stalemate with the Daleks. 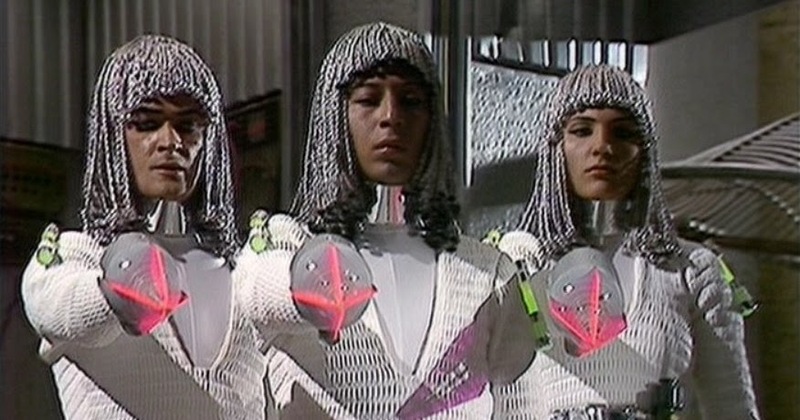 And what doesn't help the Movellans come across as a decent villain is their striking resemblance to Milli Vanilli in an 80s disco outfit! Most of what makes this story fairly decent is packed into the opening episodes, so that is a good place to start. We get a splendid introduction for Lalla Ward as Romana, taking over the role from Mary Tamm who had left at the end of the previous series, something which came as a surprise to the production team at the time. 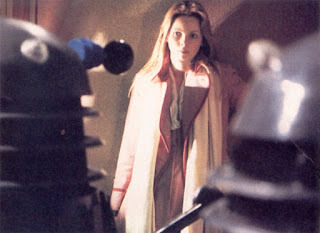 She was written out in the clever scenes which feature Romana's regeneration, something which we don't see on screen. In both of her incarnations, Romana is a lot different to previous and future companions, as she steps over the role of assistant or sidekick as she rivals and often betters the Doctor in terms of intelligence and competence - if not necessarily in experience. Romana can take the Doctor down a peg or two if she needs to, which is always a valuable trait in someone who is travelling with Tom Baker, whose larger-than-life charisma sometimes threatened to overshadow the show. Mary Tamm's Romana had been no-nonsense to the point of being cold, but Ward's take on the character was much warmer and friendlier - she was still free and independent from the Doctor but she now fully embraced the free-wheeling lifestyle the Doctor had embraced to see the universe. 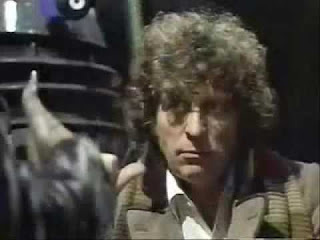 And that is also shown in her costuming for this episode, a pink and white version of the Doctor's coat and scarf. Her relationship with the Doctor quickly became one of bantering and even on some occasions, flirtation. 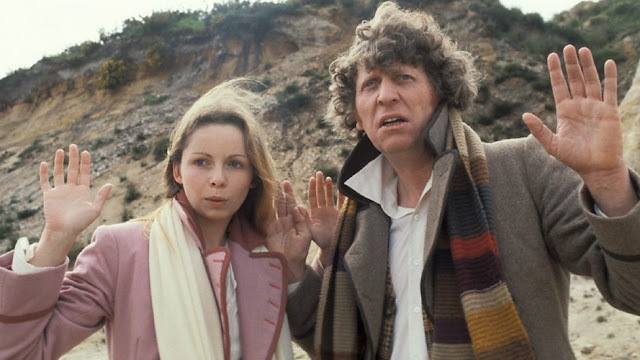 No one addressed the subtle undertones that there was a romantic relationship going on between the characters, though Tom Baker and Lalla Ward did marry in 1980. (Only to divorce two years later). But the downside of Baker and Ward's growing relationship off screen meant that their relationship on screen became a little too precious and cute, thought their easy going around each other was a key part of the light-hearted sense of fun that was the main hallmark of the Graham Williams era on the show, particularly when Douglas Adams was on board. And the dynamic between the two characters is apparent from the moment Ward appears on screen, it the witty scene written by Adams, with Romana trying on new bodies like they clothes on a rack, until she finally settling on one that both she and the Doctor like. And since Romana is supposed to be from Gallifrey, then regeneration was the obvious choice when it came to recasting the character. But the scene has been criticised for being too whimsical. And I can see why. After all, if the Doctor's regenerations have been caused by life threatening injuries, then is Romana technically committing suicide by going through bodies like they are going out of fashion? Nowadays, it could be problematic, it may have been in those days too. But it is nothing that couldn't have been fixed with a little bit of an explanation. But just by looking at in the context of the story and not as a story on its own, the little scene is a piece of comedy which does exactly what it needs to do, economically and entertainingly establish what was already a familiar character and defusing the sudden departure of Mary Tamm from the series by acknowledging it with a little joke and then moving on so that the story can begin. And given the circumstances that were happening behind the scenes, it is a little hard to think of a better way to have done it. So with that introduction out of the way, the story wastes no time in getting started, with the TARDIS landing on a mysterious planet that the Doctor finds strangely familiar. I'm sure we can already guess it is Skaro thanks to the "Of the Daleks", in the title, but the Doctor has no clue, he has landed here at random. What follows is typical of Terry Nation, the TARDIS crew explore the landscape, picking up clue after clue which point towards something dark and sinister which culminates in the revelation that those Daleks who appeared in the title are actually going to appear in the story itself. Sadly this was a narrative structure that Nation had used to many times, but I suppose it is an effective enough way to kick the story off. There is radiation, an abandoned building and strange earthquakes which reveal themselves to be underground explosions. And any eagle eyed viewer might recognise the inside of the bunker as the same bunker from Genesis of the Daleks, giving us our first clue to what - or who - the Daleks are after. So we can guess the McGuffin, even if the Doctor and Romana can't yet but that does help to build up the tension. Sure it is a formula, but it does well enough in laying out the story in a clear and simple way. This part of the adventure, up until they find Davros is the only bit that resembles something remotely entertaining. It is a grim Terry Nation story lightened by the jokes written by Douglas Adams. What makes it come undone is what comes next, the story runs headlong into trouble in how Davros, the Daleks and Movellans are portrayed and only turns even more silly when it tries to be even more serious. And unfortunately, this story becomes something that neither Nation or Adams could have been accused of being before: It's just plain boring. Once we see Davros awaken and he and the two opposing forces take over the story, all the air that had once been in the story is sucked out. The idea that both forces have reached a stalemate because they are two computer-like is simplistic at best, and seems more at home in a half-hour radio drama than a two hour Doctor Who adventure. It also makes the Daleks and the Movellans look like idiots and makes the story crawl to a conclusion which it could have reached in half the time. 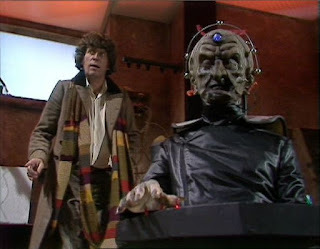 At least Davros comes off least worst, though the performance from David Gooderson is a far cry away from the unhinged megalomaniac that Michael Wisher originally created. Granted the dialogue doesn't give him the chance to be the devious master planner from the previous serial, here is mostly just angry and aggressive, with little to no reason to be either. The Movellans are certainly stern-faced and a little threatening I suppose, but since we discover they are the enemies of the Daleks early on, it is obviously meant to be shocking later on when we discover they are just as ruthless as their enemies and not the dreadlocked white knights we were supposed to believe they were. Shocker! But the revelation is so toothless because we were given little reason to care about them in the first place. Them seemed to have been written purposely flat and are sadly acted as such, they are dull robots who are easily fooled and can't handle the byzantine simplicity of rock, paper, scissors. They don't instil fear or dread. Just laughter at their stupidity. I suppose though that it is the mishandling of the Daleks which really dooms this story. It is the same problem which effects Genesis of the Daleks, they are written as robots and not as twisted mutations of a former race of the planet Skaro, who were still people, sort of. Destiny of the Daleks takes this a step too far and refers to them as just another race of robots, several times. It is not only a passive and uninteresting move but it renders them unable to think for themselves. And all of this in the name of getting Davros resurrected. At the end of Genesis of the Daleks, Davros was exterminated by his own creations. And though Nation has always claimed he was going to bring Davros back, there was no clue to this in the previous story, at the end of Genesis, Davros was good and dead. It is also a shame that it is Destiny which sets Davros up as the main character of all the Dalek stories in the 1980s. Before the story of the Daleks had always been that they escaped the ruins of their city and conquered the galaxy. But now it appears they did so only to come scurrying home as universal failures. It is actually Davros who rises out of the Kaled ruins and Davros who makes the Daleks good threat. You could even go so far to say that the re-introduction of Davros not only threatened the Doctor but the Daleks as well. And through his insistence that he is the Daleks' natural leader, he not only sees them as his children but as his property, he also ends up making them secondary characters in their own stories, reducing the Daleks to nothing more than henchmen who serve one master. In Genesis of the Daleks and some of the future Dalek stories, they aren't nearly as compliant but here, Davros seems to get away with it. The Doctor manages to beat Davros, but Davros beats the Daleks. And once he comes on the scene, the Daleks cease to function as characters who have their own motivations. All they do is follow orders and don't say anything before the Doctor manages to trick Davros into blowing them all up. Lets not forget that the reason Davros was created was to make the Daleks seem like more dynamic and interesting creations. Because all the Daleks were made to look the same to ensure some twisted form of uniformity. But the Daleks were indistinguishable from one another and many audience members tended to glaze over whenever the monsters spoke. It is unfortunate then that Destiny doesn't try to do anything with them, making the all too common mistake of assuming there is nothing interesting about them at all. And if that fact were true, then the Daleks wouldn't have lasted through the 60s. If they had been that boring they would have been all but forgotten about like the Krotons, The Mechanoids and, well, the Movellans. All right, it is true that their limitations make it hard to tell a cracking good Dalek story, but the Daleks are important to roll out every-now-and-again because in opposing their fascist, brutal and paranoid aggression, it helps to define what the Doctor believes in and tells the viewers what the moral centre of the series is all about.